Recently I had an experience that left me feeling like a total fraud when I encourage other patients with invisible illnesses like migraine disease to stand up for themselves and ask for what they need. I had the opportunity to go to an event near my hometown that draws in people from all over the state and surrounding states. 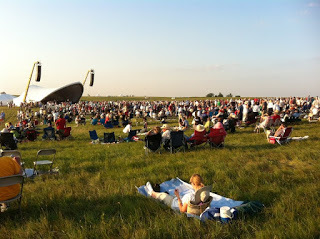 It’s an outdoor symphony on the prairie with a bunch of associated educational events, food, demonstrations, etc. I needed to use the enclosed, air conditioned shuttle for VIPs and people with disabilities, but I didn’t want to have to “come out” as a disabled person because I know I don’t look disabled. Nobody challenged me about using it, but left to my own devices I most likely would have backed off without standing up for myself if anyone had. I just had this feeling like, why should they believe me? Luckily my parents were there to force me to do what I needed to do to take care of myself. But I’m disappointed in my meek, wary response to the situation. Why is it always so much easier to tell other people what they should do than to do it yourself? Have you been in a situation like this? How did you handle it? Were you disappointed in your response?